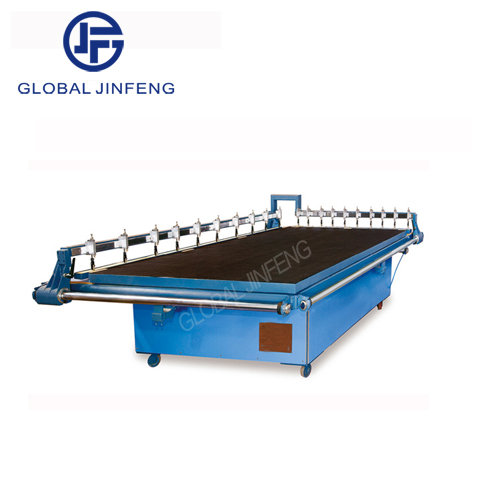 This product is suitable for high-volume cutting all kinds of square,rectangular plate glass.When the machine is operated according to the product specification,knife,knife cutting trimming knife test distance to reach the cutting precision requirements. 1.Many knives cutting efficiency is high,operation is simple and the knife box can be increase according to the need. 2.The knife clip self-lubricating,convenient to replace the cutter wheel. 3.High cutting precision,long service life,beautiful appearance. 4.The cutting machine can cut the glass thickness is 1-15mm,the customized cutting Max.size can be 4900x3400mm,Mininum cutting size is 10x10mm,the cutting precision can be ±0.10mm/m. 5.Containing air self oiling device. Household electric appliance glass,mosaic glass,craft glass,solar glass,furniture glass,art glass,LCD glass rectangular glass cutting.